Aquae Triumphus is part of the TB Palace Hotel&SPA, with this unfortunate name being one of the two negatives I could find here. 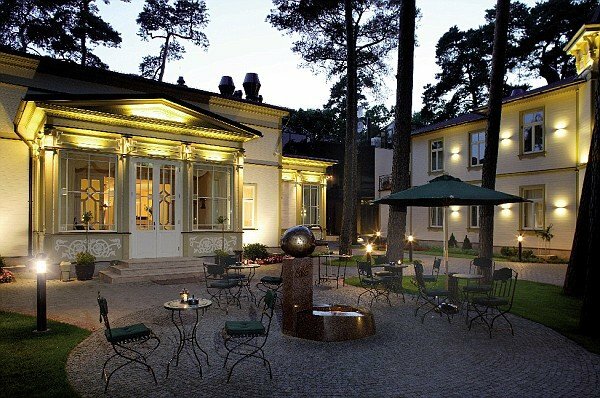 The complex combines the charm of Jūrmala's wooden architecture with a luxurious and friendly atmosphere. The hotel is so intimate, there are only four rooms - but what rooms! Each is as stunning as the precious stone it is named after. The complex also contains a fine dining restaurant and a wine tasting hall, so you can even combine your spa adventure with fine Austrian wine appreciation. In fact, the whole place received a Conde Nast Johansens recommendation in 2008. This spa takes beauty and health care very seriously, with a doctor on site giving me an individual consultation beforehand. She could also create an entire programme, custom made for my body and its needs. The only thing I didn't like about this was that I felt the doctor was also being too much of a saleswoman, trying to convince me to take an anti-aging facial procedure as well. Instead, I tried a classic back massage, and my skilful practitioner was certainly able to deliver relief from the aches and pains as she applied her own unique method combining a variety of techniques she had mastered over the years. I personally also liked the cosy atmosphere of this spa, with a calming minimalist style decor and soft music washing over me as I enjoyed the massage.